14 different wheel options are available. 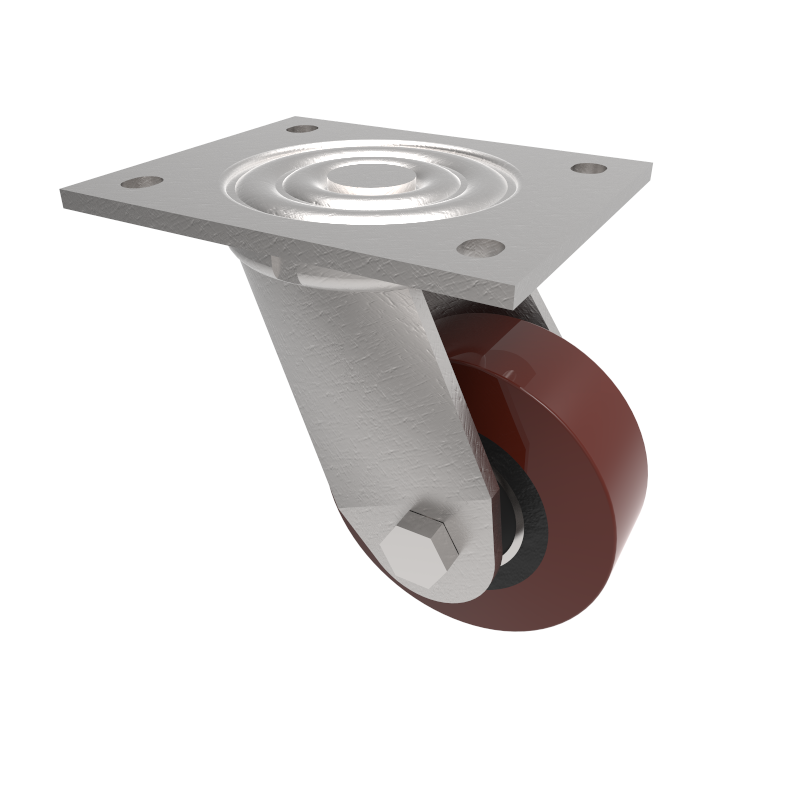 Wheel diameters from 100mm to 400mm. Load ranges from 160kg up to 7000kg per castor. Fabricated fixed castor with a top plate fixing fitted with a white nylon wheel with a plain bearing. Wheel diameter 100mm, tread width 35mm, overall height 143mm, top plate 135mm x 110mm, hole centres 105mm x 80mm. Load capacity 400kg. 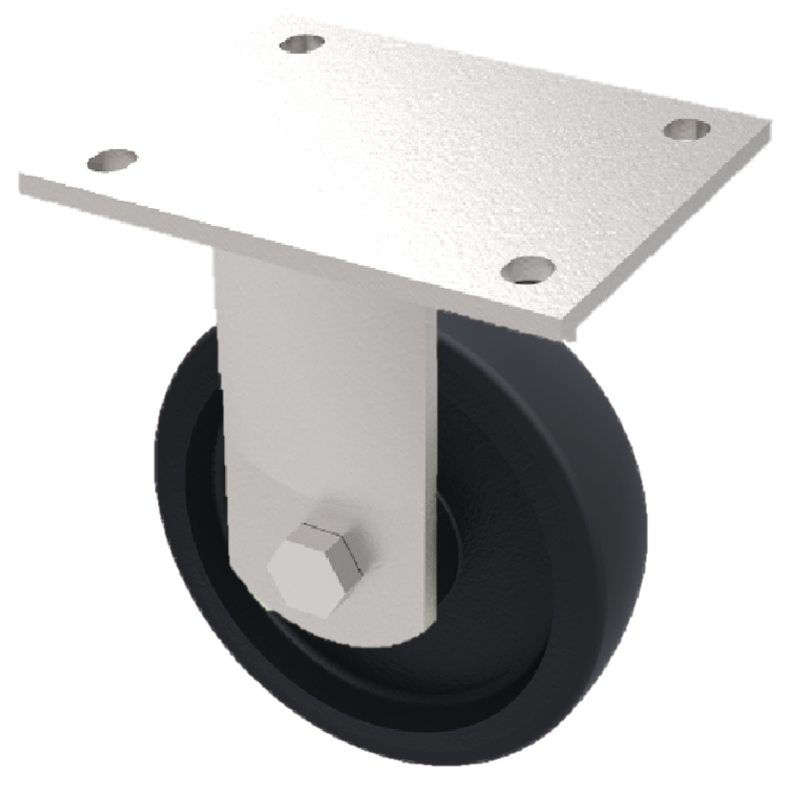 Fabricated fixed castor with a top plate fixing fitted with a white nylon wheel with a plain bearing. Wheel diameter125mm, tread width 45mm, overall height 165mm, top plate 135mm x 110mm, hole centres 105mm x 80mm. Load capacity 400kg. Fabricated fixed castor with a top plate fixing fitted with a white nylon wheel with roller bearings. Wheel diameter 125mm, tread width 45mm, overall height 165mm, plate size 135mm x 110mm, hole centres 105mm x 80mm. Load capacity 400kg. Fabricated fixed castor with a top plate fixing fitted with a white nylon wheel with a plain bearing. Wheel diameter 150mm, tread width 45mm, overall height 190mm, top plate 135mm x 110mm, hole centres 105mm x 80mm. load capacity 500kg. 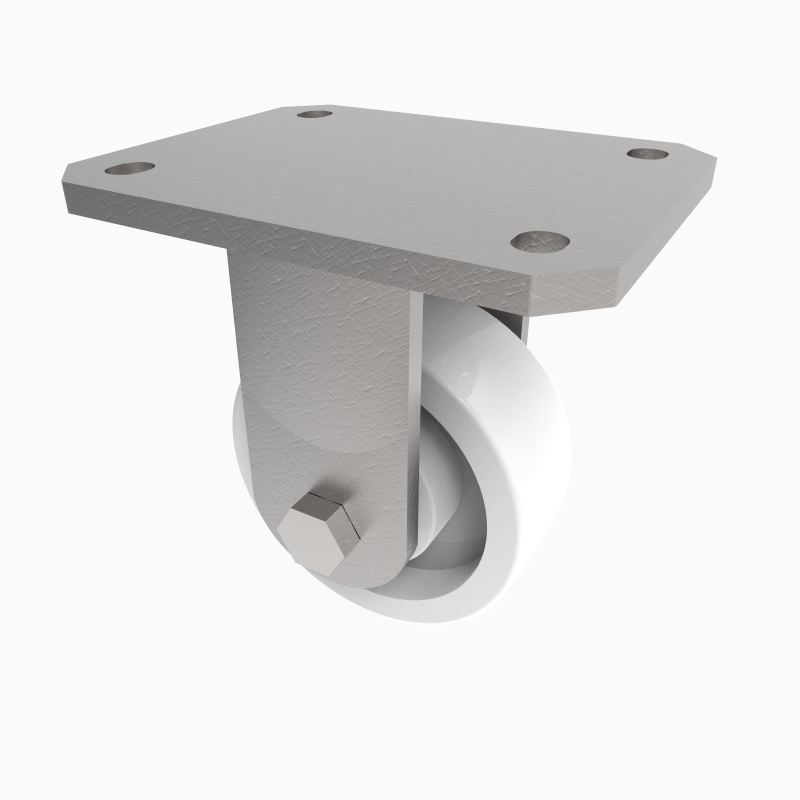 Fabricated white zinc ROHS plated fixed castor with a top plate fixing fitted with a white nylon wheel with a plain bearing. Wheel diameter 100mm, tread width 35mm, overall height 143mm, top plate 138mmx110mm, hole centres 105mmx 80mm/75mm. Load capacity 400kg. 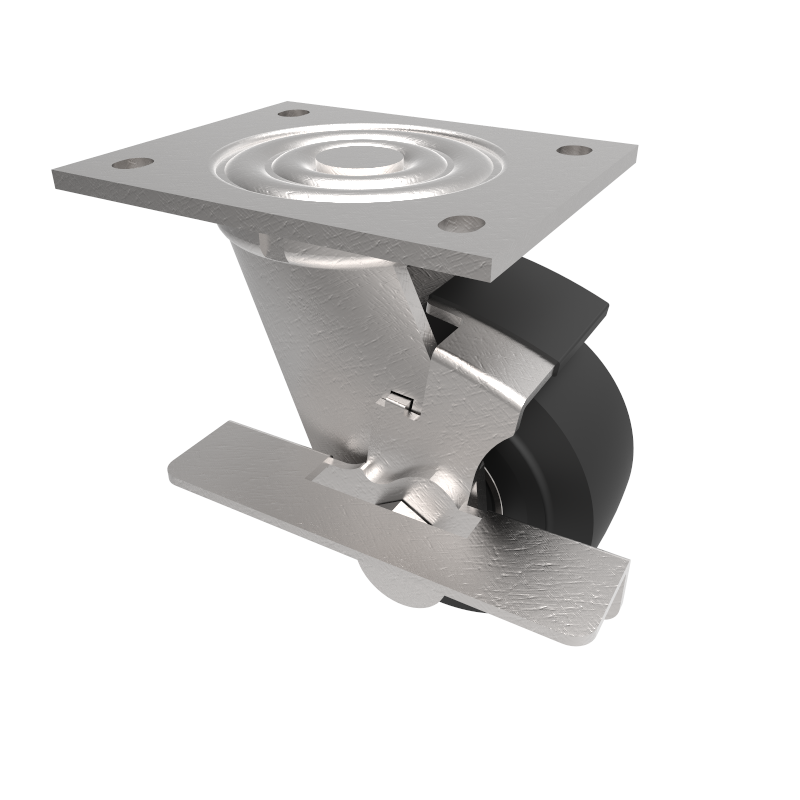 Fabricated fixed castor with a top plate fixing fitted with a white nylon wheel with plain bearings. Wheel diameter 100mm, tread width 35mm, overall height 140mm, top plate 138mm x 110mm, hole centres 105mm x 80/75mm. Load capacity 400kg. 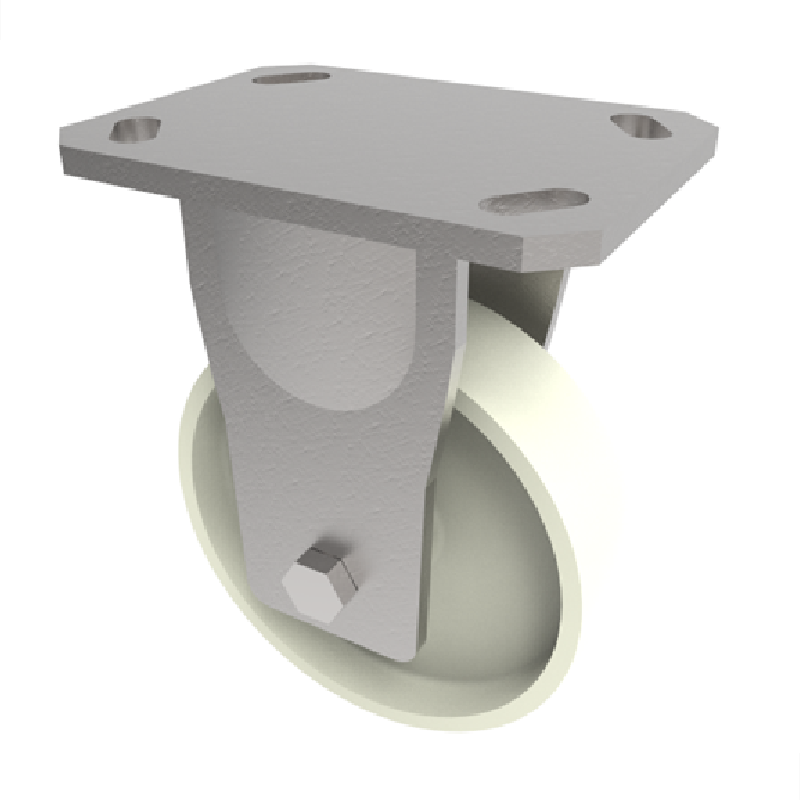 Fabricated white zinc ROHS plated steel fixed castor fitted with a white nylon wheel with a plain bearing. 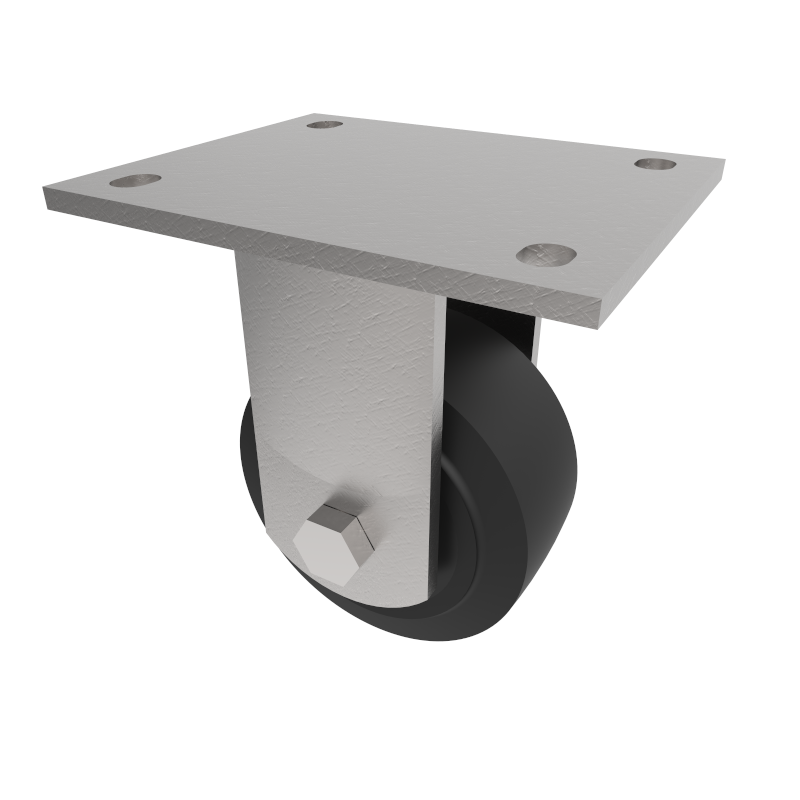 Wheel diameter 125mm, tread width 45mm, overall height 165mm, top plate 138mm x 110mm, hole centres 105mm x 80mm/75mm. Load capacity 600kg. 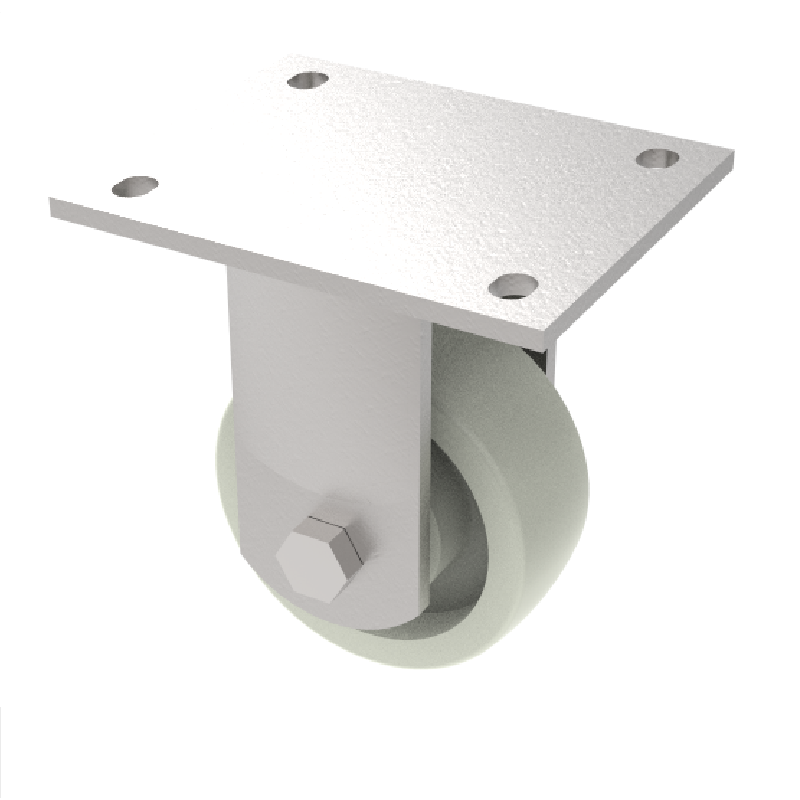 Fabricated fixed castor with a top plate fixing fitted with a white nylon wheel with a roller bearing. Wheel diameter 150mm, tread width 45mm, overall height 190mm, top plate 135mm x 110mm, hole centres 105mm x 80mm. Load capacity 600kg. Fabricated fixed castor with a top plate fixing fitted with a white nylon wheel with ball bearings. Wheel diameter 100mm, tread width 40mm, overall height 143mm, top plate 135mm x 110mm, hole centres 105mm x 80mm. Load capacity 400kg. Fabricated fixed castor with a top plate fixing fitted with a black cast iron wheel with a plain bearing. 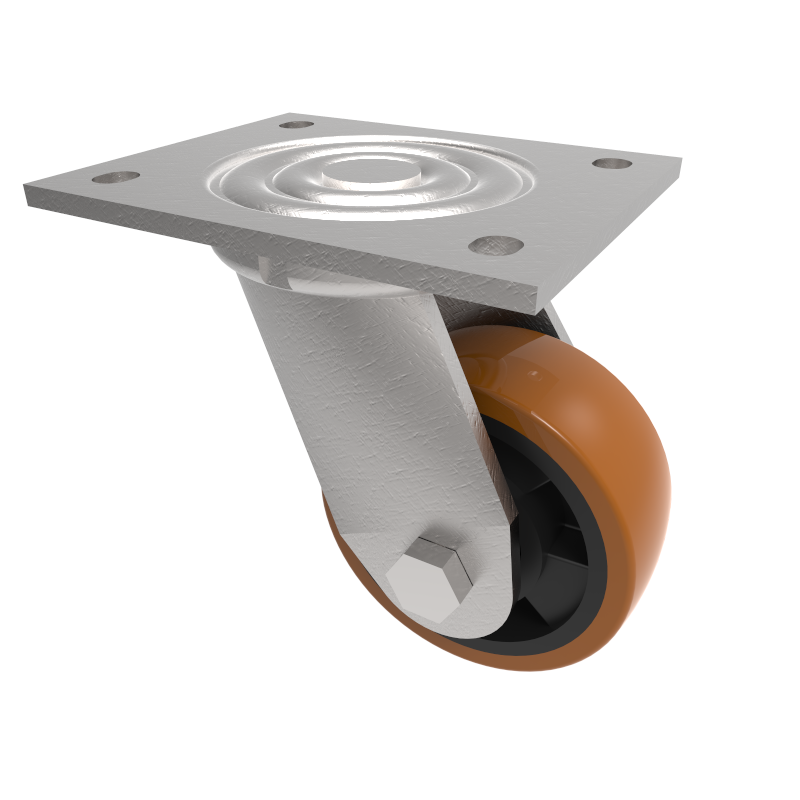 Wheel diameter 100m, tread width 50mm, overall height 143mm, top plate 135mm x 110mm, hole centres 105mm x 80mm. Load capacity 400kg. Fabricated fixed castor with a top plate fixing fitted with a red polyurethane tyre white nylon centred wheel with ball bearings. Wheel diameter 100mm, tread width 40mm, overall height 143mm, top plate 135mm x 110mm, hole centres 105mm x 80mm. Load capacity 250kg. 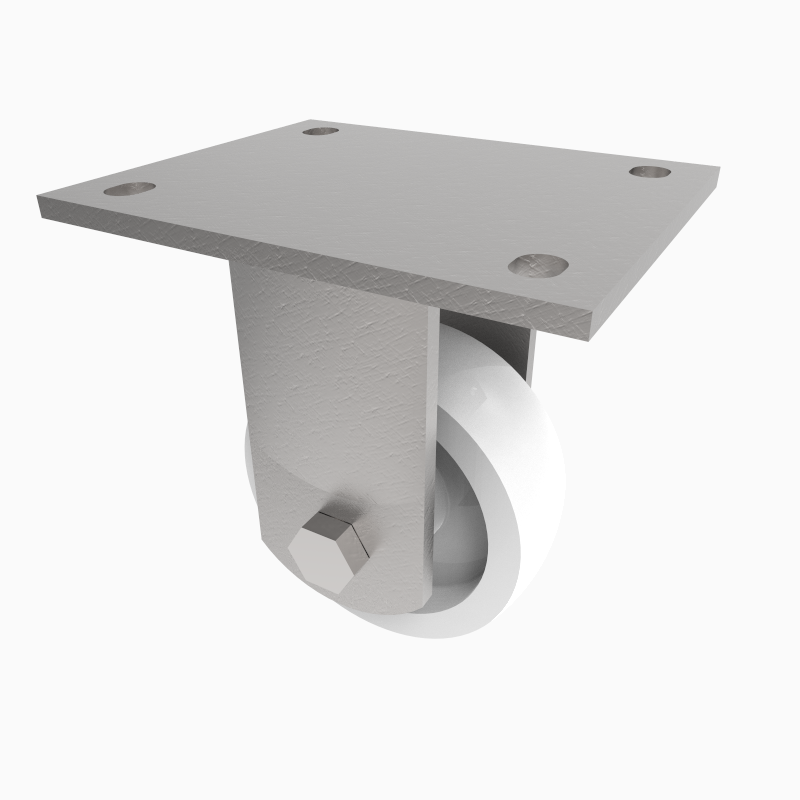 Fabricated white zinc ROHS plated steel fixed castor fitted with a white nylon wheel with a roller bearing. 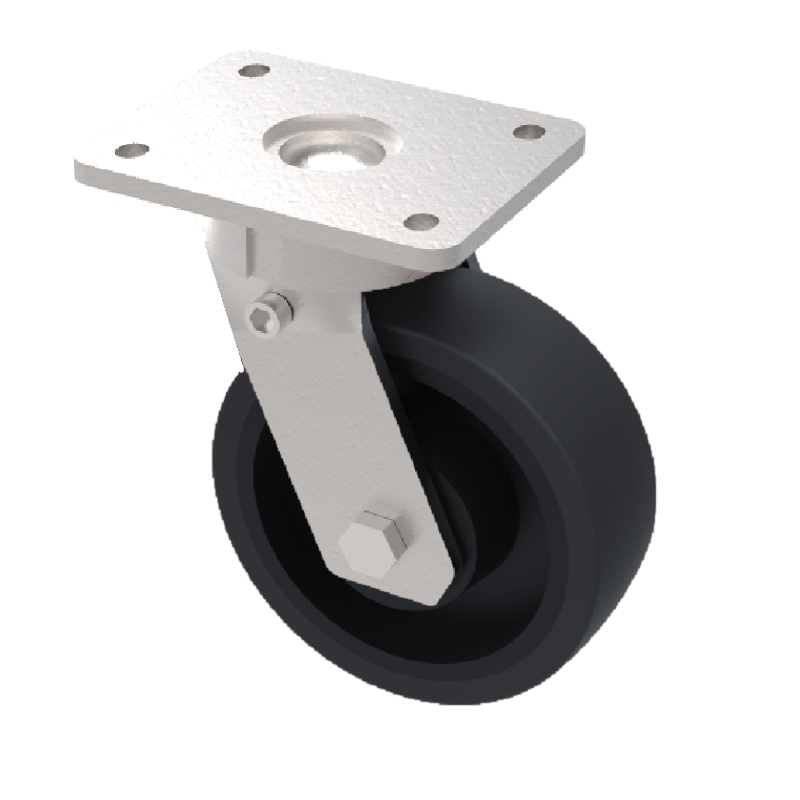 Wheel diameter 125mm, tread width 45mm, overall height 165mm, top plate 138mm x 110mm, hole centres 105mm x 80mm/75mm. Load capacity 600kg. 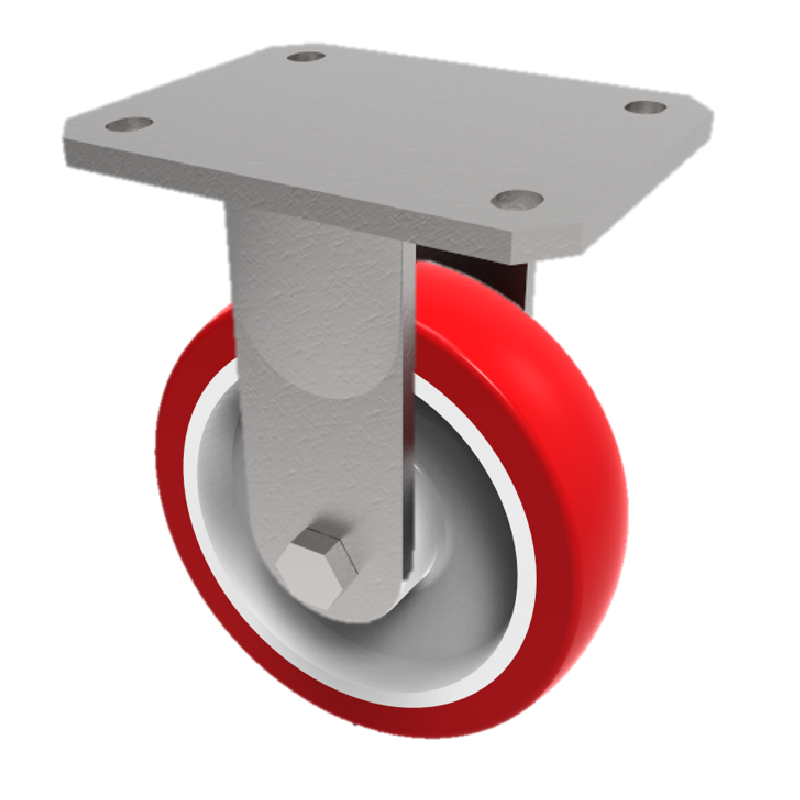 Fabricated fixed castor with a top plate fixing fitted with a red polyurethane tyred white nylon centred wheel with a plain bearing. Wheel diameter 150mm, tread width 40mm, overall height 190mm, top plate 135mm x 110mm, hole centres 105mm x 80mm. Load capacity 500kg. 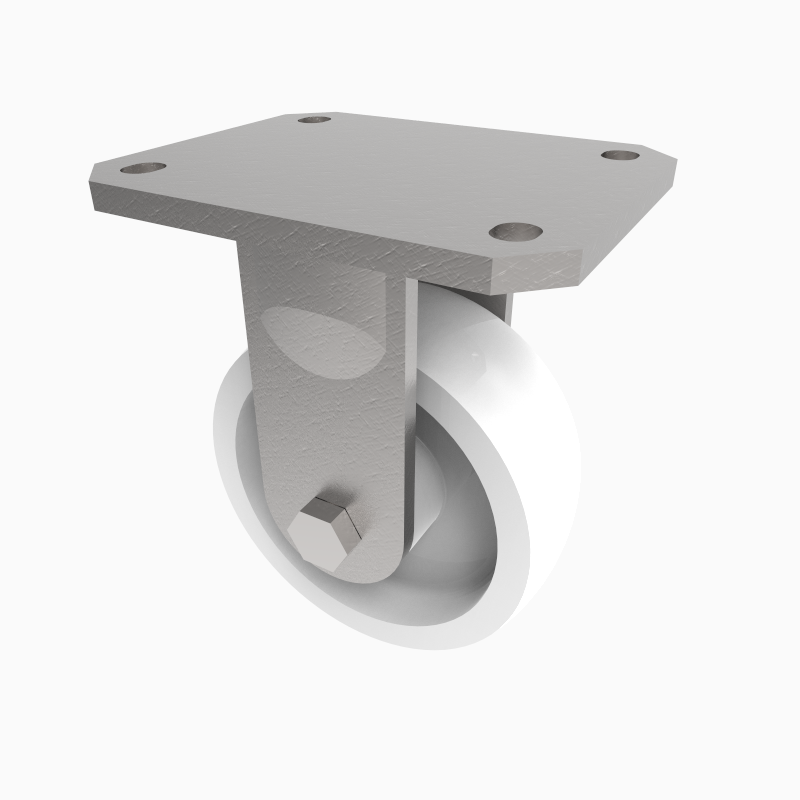 Fabricated fixed castor with a top plate fixing with a white nylon wheel with plain bearing. Wheel diameter 125mm, tread width 45mm, overall height 177mm, plate size 150mm x 110mm, hole centres 105mm x 80mm or 121mm x 59mm. Load capacity 750kg. Fabricated fixed castor with a top plate fixing fitted with a white nylon wheel with ball bearings. Wheel diameter 150mm, tread width 45mm, overall height 190mm, top plate 135mm x 110mm, hole centres 105mm x 80mm. Load capacity 600kg. Fabricated fixed castor with a top plate fixing fitted with a white nylon wheel with ball bearings. 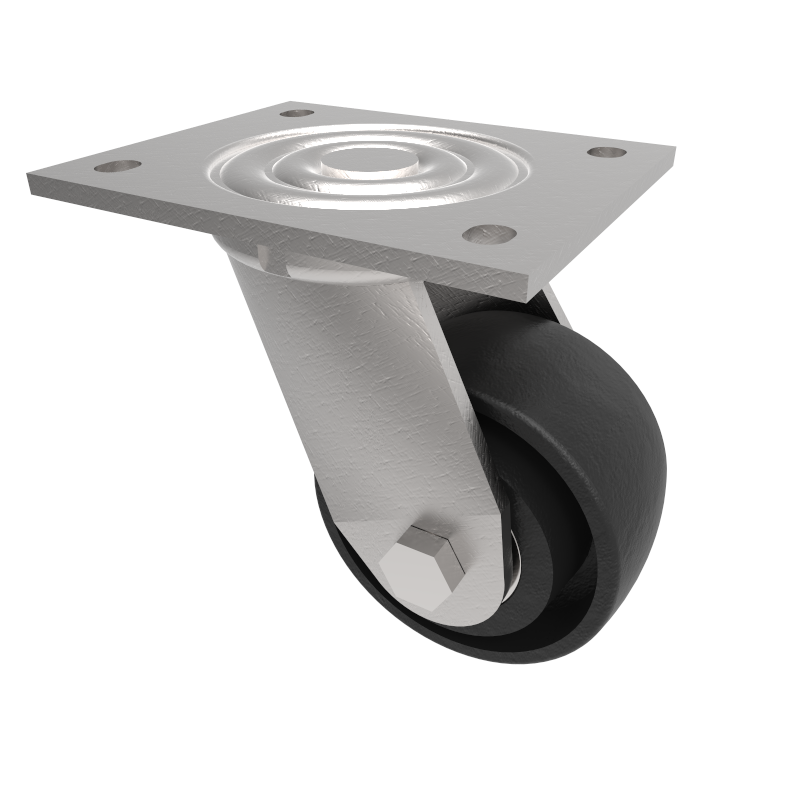 Wheel diameter 100mm, tread width 40mm, overall height 140mm, top plate 138mm x 110mm, hole centres 105mm x 80/75mm. Load capacity 650kg.